We all need Accessories in our life, whether it's a cute Scarf, a piece of Jewellery to set off an outfit or a Makeup bag to keep all your Beauty products in. Lylia Rose offers a gorgeous range of Ladies Accessories. Everything is £15 and under and you get free first class UK delivery, not bad hey! So Christmas is only 21 days away, Yay! If you haven't done your gift shopping yet, don't panic! Lylia Rose will rescue you, with their stunning range of Scarves, Jewellery, Bags and Brooches you're sure to find the perfect gift. I am obsessed with Beauty Products and Make Up! Due to my ever growing collection, I can never have enough Make Up Bags. When I saw the Lylia Rose Pink Love Birds Make Up Bag I absolutely fell in love, not only is it in my all time favourite colour but it also has the most adorable design ever. It zips up so nothing will fall out plus it's big enough to carry what you need and small enough to put inside your Handbag. I always try and just put the Products I need for the day into my Make Up Bag but I always end up bringing three times as much! You never know when you might need something and the day I don't have a certain product with me will be the day I need it! Here are just a few of my other favourite items from Lylia Rose that I would love for Christmas! You can get Get 20% off by entering code SophieWonderland at the checkout. There's no expiry date on this code so you can order whenever you want! Don't forget to check out Lylia Rose over on Twitter, Pinterest & Instagram. *Thank you to Lylia Rose for gifting me the item. Lovely accessories. I like the necklace and charm bracelets. They would make great gifts too. This is definitely for me, I have not yet done any shopping and the scarves look cute for a present. 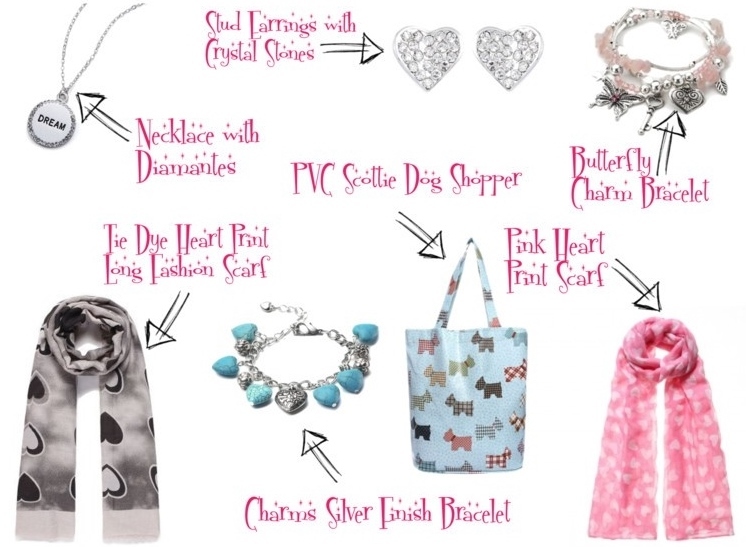 These are all really cute, but I especially love the shopping bag and the pink scarf. Those heart earrings are cute. I love the bottles of Britney perfume in that picture. That's still one of my fav scents. My husband might flip if I bring home another makeup bag but this one is too cute! I love the print on that makeup bag! And those charm bracelets are adorable! That makeup bag is SO cute! I love all of your picks!